Clouds are an important part of the Arctic climate because they trap warm air at the surface like a blanket. There has been a continuous increase in cloud cover over the Arctic for the past two decades and this is driving big changes on land and in the ocean. The increasing cloud cover has exacerbated the Arctic amplification and is a major reason why the Arctic is warming twice as fast as the rest of the planet. 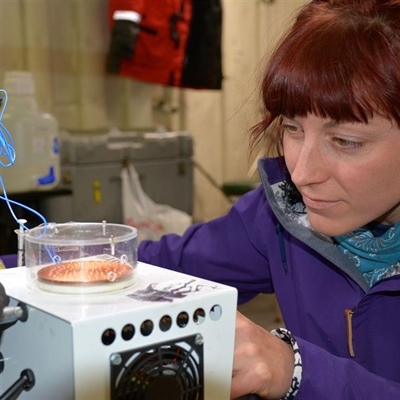 Jessie Creamean, Ph.D., a CIRES scientist with NOAA Research in Boulder, Colorado is here with us aboard the U.S. Coast Guard Cutter Healy measuring the types of aerosols in the Arctic atmosphere that have the ability to form tiny ice crystals. More specifically, she is collecting samples of aerosol particles to look at their chemistry, biology, shape, size, and ice-forming capabilities, in addition to how many of them there are in the atmosphere. These special kinds of aerosols are called "ice nucleating particles" or INPs, and they are very important for the seeding of Arctic clouds. The Arctic Ocean can be a significant source of these INPs, but observations in this region are very limited. Breaking waves can eject tiny droplets into the atmosphere that contain these INPs and with more open water with the loss of sea ice, there are likely more INPs being sent aloft. Because of this, Jessie is collecting and analyzing samples from the air and seawater to determine how big of a source the ocean is of these aerosols. Any ice-nucleating particles in there? I asked Jessie why she wanted to study aerosols in the Arctic when she has worked all over the world. “The Arctic is such a dynamic region and we know so little about it that I wanted to come up here and use my techniques to improve our understanding of this very important place,” she said. Along with warming, the formation of clouds over the Arctic Ocean can also impact the way moisture moves around the region either through snow or rainfall. And the effects can go well beyond the local environment. What happens in the Arctic can affect weather patterns globally, since global wind circulation patterns are all connected. Clouds and aerosols are just another piece of the puzzle that we’re up here trying to solve to gain a better understanding of the transitions in the Arctic environment and beyond. For more information, please contact Theo Stein, NOAA Communications, at 303-497-6288 or theo.stein@noaa.gov.